After last week’s stroll through the village of Agios Ioannis I thought we'd walk down the road for a bit and then cut across into the valley below where there’s an old olive press that I’ve long wanted to prowl around. 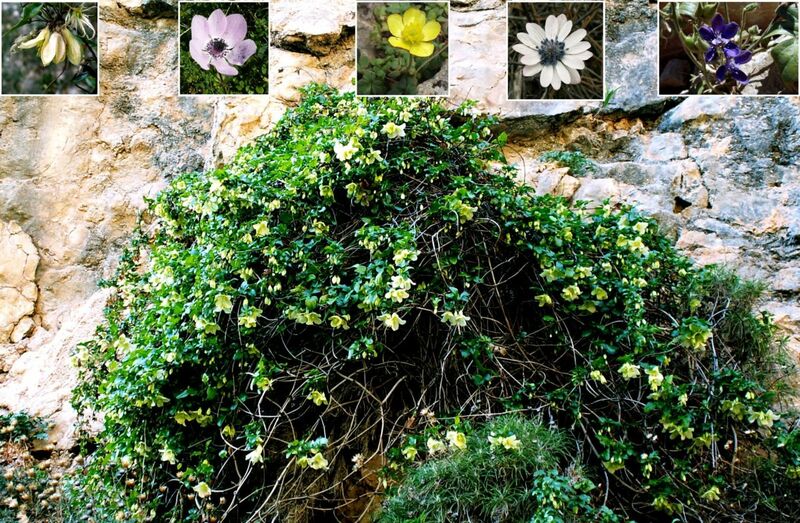 But first, here growing wild at the side of the road is a magnificent straggling clematis climbing the rocks. Obviously, like anemones and delphiniums, it’s a type of buttercup. No, I haven’t finally taken leave of my senses they are all part of the Buttercup family, the Ranunculaceae. But how can such wildly different looking plants all be closely related? It all comes down to plant systematics, the biological classification of plants. A couple of hundred years before Christ was born, a wandering Greek philosopher called Theophrastus started us off by grouping plants loosely into trees, shrubs and herbs. Another Greek, Dioscorides who was a medic in the Roman army, refined this a few hundred years later when he classified over five hundred plants according to their medicinal properties and this became the standard reference work right up until the sixteenth century. Classifying plants by their similarities in structure then took over culminating in Linnaeus publishing his Species Plantarum in 1753 (he dwelt on their sexual organ arrangements but then, he didn’t get out much). 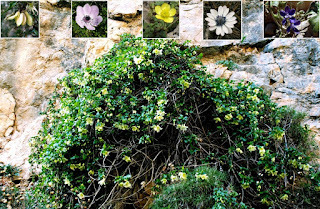 Darwin’s publication On the Origin of Species in 1859 pushed us towards classifying plants based upon their evolutionary relationships and nowadays we use DNA analysis to refine that concept in the science of cladistics (see Taxing Taxonomy and Confusing Cladistics) and that’s why clematis is a type of buttercup – they share a common ancestry.